We saw The Pajama Game at the Muny Friday night. We had never seen it before and were not familiar with the story line. It takes place in a pajama factory in the 50's and it's the story of management versus the union. One of the managers falls in love with a woman in the union. The union is threatening a strike if they don't get a 7 1/2 cent raise (hee hee hee). Of course, all ends well, the union gets the raise and the man and woman live happily ever after. The weatherman had predicted storms for the late afternoon ending around 7:00pm. Well, he was wrong. The storms started at about 7:45pm. We were sitting in our seats when it began sprinkling. We opened our umbrellas and stayed for about 1 minute when it began pouring and we decided to head under cover. The rain lasted for about 15 minutes and it delayed the start of the show by about 20 minutes. It helped to cool the temperature to a comfortable level. Next week, Joseph and the Amazing Technicolor Dreamcoat. I think my digital camera is dead. When you look at the LCD screen, there are squiggly lines, almost like static. When I take a picture, the static actually shows up in the photo. Grrrr...I guess I'll need to buy a new camera. If anyone has a suggestion as to the kind of camera I should buy, please let me know. There are so many to choose from and they all have so many different features. It makes my head spin! The bad thing is, until I get a new camera, I won't be able to take any pictures of new cards to post here on my blog. I think I may have a few pictures of cards that I have not yet posted so I may have a couple to share with you. If not, I'll just ramble on about other things...hee hee hee. Bill has been wanting to paint the inside of the house for quite some time. We just had it painted about 2 years ago but he wanted something other than white. Well, we finally took the plunge and started painting on Sunday. We chose a color called Pecan Sandy and it's very pretty. I really like it and can't believe that I didn't agree to do this sooner! I painted the powder room (half bath) last weekend and I really like it too. We chose a color called Emily's Doll House which is a really pretty shade of lavender. We're only painting the family room and kitchen so hopefully we'll be finished by this weekend. I did manage to stamp over the weekend. I still have to take pictures of some of the new creations but I'll try to do that in the next day or so. We saw Peter Pan at the Muny Friday night. Francis Jue played Peter Pan and he was great in this role. We've seen him before as the King in King & I and Ito in Mame. Traditionally, a woman plays Peter Pan and Mary Martin is probably the most famous Peter Pan. Peter, Wendy, Michael and John all flew across the stage. Of course, this delighted all of the kids in the audience, including me...hee hee hee. When I was at the Amusa-A-Palooza event last week, I purchased a pack of Amuse Kiwi note cards. I didn't really need them because I have a ton of card stock but these little cards are so cute. You can create a quick and easy card in no time. 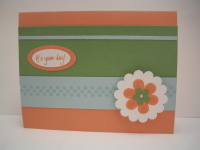 I chose the Kiwi note cards because the color is close to Certainly Celery by Stampin' Up and I just love that color. I stamped the flower image from Sweet on You in black ink on Whisper White and then punched it out with the Marvy Uchida Mega scallop oval punch. I punched a piece of Apricot Appeal with the Giga punch and layered the two pieces. I added Certainly Celery brads to each side. A piece of white grosgrain was added and then the focal image was placed on top. The "thanks" stamp by Lockhart was inked in black and stamped in the lower right corner. Viola...About 10 minutes start to finish. I'm taking a day off work tomorrow. Both cars need an oil change and mine is due for the state inspection so that I can renew my license plates. I might have some time to stamp. The weather is supposed to be really nice though so I may just have to spend some time outside instead. Each July, Stampin' Up introduces six new colors that are only available for one year. This year, the "In Colors" are Purely Pomegranate, Wild Wasabi, Groovy Guava, Soft Sky, Blue Bayou and River Rock. Naturally, I had to add these to my collection. Here is one of the cards I created with three of the new In Colors. When I first saw the new colors, Guava was my least favorite because I'm not a peachy, coral, type of girl. I will say, however, that this particular shade is really pretty. It reminds me of a lighter shade of orange sherbet. Anyway, I was inspired by a card shown on page 155 in the new Stampin' Up catalog and decided to use Guava for the card base. I added a 2-inch strip of Wild Wasabi and a 1-inch strip of Soft Sky. I inked my new stamp by Penny Black called Polka Row with Soft Sky and stamped it on the card stock for a tone on tone look. I stamped one of the flowers from the Big Flowers set (Stampin' Up) in Guava and cut it out using the new scallop punch. I then used one of my smaller flower punches to create a center for the flower using Wild Wasabi. The middle of the flower still needed something else so I punched a 1/16th circle, which really is nothing more than a very small dot, glued it to the center of the flower and the attached it to the card using dimensionals. The sentiment is from Amuse and is stamped in Guava and punched with the smaller oval punch. The larger oval punch was used to create the mat behind the sentiment and a very small strip of Soft Sky was added to the top. All card stock and ink are @Stampin' Up; stamps as mentioned in the description above. My nephew, Gecko Dude, turned 13 today. He's officially a teenager. Oh my goodness...it seems like just yesterday he was a tiny baby. Three more years and he'll be driving. I always check the beer aisle every time I'm at Dierberg's which, by the way, is at least three times a week. I have to make sure I'm not missing out on any exciting new brews. Well, yesterday I was standing in the beer aisle and I just about wet my pants in excitement. Guess what I saw...Firerock Pale Ale and and Longboard Lager from Kona Brewing! Woohoo...liquid aloha. I bought a six-pack of the Firerock and we enjoyed a few with our dinner last night. I almost felt like I was back in my beloved Hawaii. I am so very hau`oli (translation: happy). Kona beer is only shipped to 16 states outside of Hawaii. Luckily Missouri is now one of those states! Perhaps my other favorite Hawaiian brewery, Maui Brewing, will soon follow suit. Aloha au i Hawaii! (I love Hawaii). My best friend, Jenny, and I saw Hello Dolly at the Muny Friday night. Hello Dolly is one of my all time favorite musicals. I love the costumes, I love the songs, I love the storyline. When the list of Muny productions was released earlier this year, I was so happy to see that Hello Dolly was one of the 2007 shows. Anyway, this was Jenny's first visit to the Muny and she really enjoyed it. Luckily the weather was great; low humidity and relatively low temperatures (low 80's). Gretchen Wyler played Dolly Levi the last time Hello Dolly was performed at the Muny in 1997. We had season tickets that year and I absolutely loved Gretchen's portrayal of Dolly. Granted, I have never seen Carol Channing (is she this tiny?) or Toni Tennille (she played the role of Dolly Levi in a Nevada production) in this role but I must say that Gretchen was the perfect Dolly. Sadly, Gretchen passed away May 27. This production of Hello Dolly is dedicated to her memory.